4 bedrooms, two bathrooms, two separate toilets, sauna, fireplace, trampo. A wonderful place in the middle of nature, on the border of the Oosterschelde National Park. 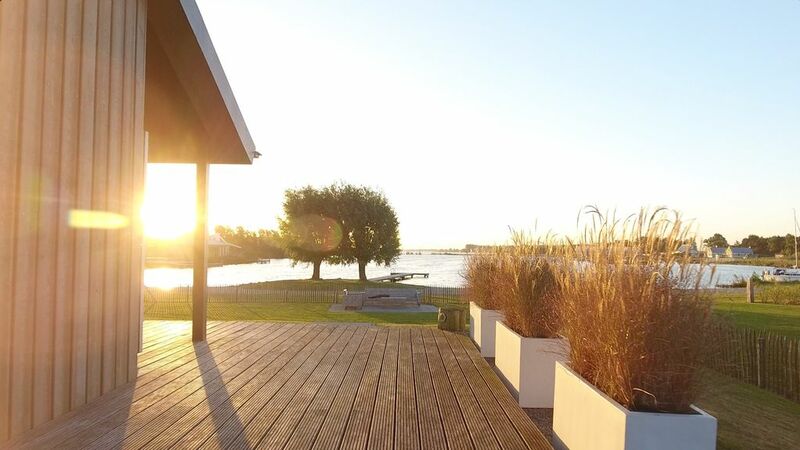 The property, located directly on the water, has a wide view over the Deep and Bergsche Zoommeer. Equipped with a luxury kitchen (microwave, dishwasher, coffee and tea. The two toilets are separate from the two bathrooms. One bathroom has a shower and separate bath, the other a shower and sauna. The living room has a cozy dining table for 8 people, a sitting area and fireplace. Outside is lovely to sit under the porch or on the wooden deck next to the house where until late evening enjoying the sun falls. The house has wireless internet and an audio / video set. Please note: from May 2019 the new center building is ready, with numerous facilities such as a restaurant, bar with terrace on the water, etc. See one of the photos. Bathrooms feature walk-in shower with drain gutter, designer radiators and sink. Canoe and pedal boat rental on the spot. Gezellig ingericht huis. Heerlijk grote tuin. Veranda is ook erg gezellig en hebben we begin oktober nog buiten kunnen ontbijten.